Gamma rays are the most energetic forms of light in the Universe. They’re generated by a variety of sources, from the heated material surrounding supermassive black holes, to the supernova explosions of dying stars. But some have theorized they might also be produced by dark matter. Dark matter doesn’t interact strongly with regular matter, nor does it interact strongly with light. But since efforts to detect dark matter directly have failed so far, we aren’t entirely sure what makes up dark matter. This has led theorists to develop lots of models about how dark matter might interact with itself. Some dark matter models propose that while dark matter doesn’t interact with regular matter, dark matter particles can collide and annihilate to produce gamma rays, similar to the way matter and antimatter can produce gamma rays through annihilation. Since dark matter is fairly spread out throughout our galaxy, this would produce a diffuse background of gamma rays. Interestingly, the gamma ray background we observe is diffuse. About 80% of the gamma rays we observe don’t come from a specific source such as supermassive black holes. It’s possible that they come from distant sources we can’t pinpoint, but it could also come from diffuse dark matter interactions. At least that’s been one idea. 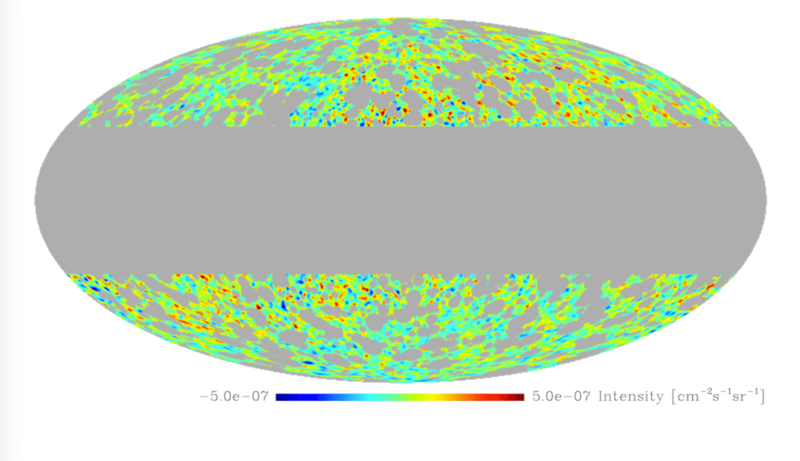 But a recent survey of the gamma ray background doesn’t support the dark matter models. Using 81 months of data from the Fermi telescope, the team was able to distinguish the energy levels of different gamma rays, and found that they tend to occur at two energies. The highest energy gamma rays seem to come from known sources such as black holes and supernovae, while lower energy gamma rays don’t have a clear source. However, the distribution and energy range of the lower energy gamma rays is inconsistent with dark matter models, so most of them can be ruled out as the source. To be clear, this does not mean that dark matter doesn’t exist (as some popular articles have claimed). It does, however, mean that dark matter doesn’t emit gamma rays. So the dark matter enigma continues to evade a solution, and this new study simply adds to the mystery. Getting back to the antimatter post from a few days ago – what about the gamma ray background excludes the possibility that it is produced by antimatter – matter collisions? Could there be a grouping of antimatter eg individual stars, or groups of stars, or galaxies etc that matches? One is the energy range, but the other is the distribution. We would expect to see strong gamma rays specifically at the boundary regions between galaxies, which we don’t. In no way does work like this invalidate the Nobel Prize that Vera Rubin didn’t get. So if “Gamma rays are the most energetic forms of light in the Universe” would any energy level above that induce the matter that made it into a black hole? No, gamma rays are just everything above x-rays. In practical terms there’s an upper limit, but there’s no category of light with shorter wavelengths than gamma rays. If dark matter detectors have yet to find anything, based on current theoretical models, how can the lower-energy, diffuse observations from Fermi be ruled out so easily? It seems a bit arbitrary to do so. Though, I do not understand the physics to the degree that you do, so the explanation may very well be valid.